Truly, we have to step up, and I hoped Give a Sh*t. Do Good. Live Better. Save the Planet. would help me do it. But I have a love/hate relationship with Give a Sh*t. I wanted to love it, and there’s a lot to love. Ashlee Piper has boatloads of passion and has given a lot of thought to various ways to minimize our carbon footprint, waste less, and save money. There are some wonderful lists of hints and tips, and I absolutely adore her kit that she takes with her everywhere that lets her eat out without creating more trash; it has utensils, a napkin, a tiffin, a canning jar, etc. Everything you need to eat somewhere without piling up paper and plastic trash. Just neatly convenient and environmentally thoughtful. There are lots of other great tips, many of which we’ve seen before, but it’s really nice to have them all in one place. I’d like to see even more. 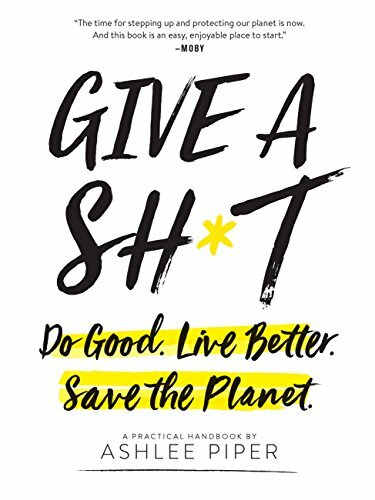 In many ways, this would be a great book to hand to someone who is absolutely clueless about the environment and who is just getting started on this road. But I’m aware, as is most of the universe, that global warming is an issue, we need to repurpose and recycle, and I wanted a handbook – a true handbook. I already make my own tooth powder, body powder, carbonated water, etc., and do such things as eschew almost all prepared foods (I buy some flatbreads) and I cook from scratch, ferment foods, buy a lot of bulk, and carry my own shopping bags everywhere (which is one of her tips that I think the most oblivious person knows we ought to do). That’s where this book is disappointing. The cover states that this is a practical handbook, but in reality Piper has done a lot of preaching to the choir, and the practical lists and recipes are relegated to second place behind a whole lot of passionate soapboxing. If you’re looking for boatloads of statistics and cases, and you haven’t been watching the news or following current science trends, it might all be new to you, but I got really bored at times. In addition, Piper needs an editor. I know some don’t care about errors, but I do, as do many others. Especially in a book that purports to being somewhat scientific. It’s not “the Great Salk Lake,” commas should stay in their place (as should all punctuation and spacing), and the answer to a comparative question should not be “no.” Example from the book: “Does said coffee taste better when it’s made in one of those wasteful K-Cup things or via a no-energy-required French press? Answer: no.” If the “or” was changed to “rather than” or something similar, it would be correct, otherwise, it just makes you do a double-take for a second to reread it and realize what she meant. Another example: “Animal testing, also known as vivisection…” Vivisection is not a synonym for all animal testing, although animal testing can include vivisection, not all animal testing is vivisection. Vivisection specifically refers to actual surgery and invasive cutting procedures performed on a living animal. (Although, to be clear, animal testing – especially on cosmetics, cleaning supplies, etc. – is still illogical, cruel, and unnecessary.) Another error: “London recently wrangled a 130-ton fatberg that cost $130 million a month to dismantle.” It took three weeks to dismantle that particular fatberg, and the $130 million per month is how much is spent cleaning up all the fatbergs that occur in the London sewers. If Piper makes errors reporting facts that we know, how can we trust her to accurately report those that we are not familiar with? I’d keep quoting errors, but I’ve already created a wall of text. These are things that an editor should have caught and corrected. In addition, I believe a good editor might have suggested that Piper started with more practical actionable information at the beginning of the book, rather than the heavy-handed global warming treatment. That call to arms has been done so many times before, and it causes this book to lose its stated function as a handbook that will guide us room-by-room through our homes with tactics for a more eco-friendly lifestyle. I’m concerned by some of Piper’s recipes and suggestions, for example: Piper uses all-purpose flour in her recipes, which is one of the least nutritious, horrid-to-the-earth monocultured grains ever. She espouses almond milk which takes more water than cow milk to produce. Plus her recipes call for superfine sugar. White sugar is simply empty calories with zero nutrition, and one of the most abused crops as far as unfair labor practices and land abuse. In her defense, she does mention buying fair trade in a different part of the book, but never mentions fair trade sugar, coffee, or cocoa/chocolate, three of the most important items that you should always buy fair trade only. She only mentions checking for fair trade coconut oil and shea butter. Another concern: Piper states that people and/or companies can offset their carbon footprint by paying for carbon credits, which in no way addressees the real problem, but is bribing one’s way out of it, which I think should be counterintuitive to a true eco-friendly lifestyle. I want to mention, since I received an ARC, that the typos and errors I mention exist in the finished book. I bought and read the published Kindle version of the book as I requested the NetGalley proof the day before the book was published and didn’t have time to read it, so switched to the real deal, as I was so pumped by the idea of this book that I went ahead and pre-ordered it. Overall, there is some good information in this book, but I fear it is overshadowed by the presentation and the errors and inaccuracies, so I can give it only two stars. I’d give this book one star, but I feel very strongly that this could be a much better book, and even as it is, beginners to an eco-friendly lifestyle would find it more useful than someone who has already started on that journey (but then again, do we want them reading such inaccuracies and thinking they are correct? ), so I’m bumping it up to two stars, which is below average. Despite the book’s problems, I found myself still reading on, looking for more good practical tips. I find myself conflicted, but I cannot rate it any higher or give it an unqualified recommendation.